The Exchange Hotel Cardiff is a stunning venue, tucked away in the back streets of Cardiff Bay. It’s been beautifully restored and is full of character and elegance, making it an ideal venue for an engagement shoot, romantic weekend away or decadent afternoon tea. Sanita and Harvi are a lovely couple. I’ve known Sanita for a couple of years now and I was thrilled when she asked me to be her wedding photographer. They particularly wanted their engagement shoot to have more sophisticated and elegant feel. 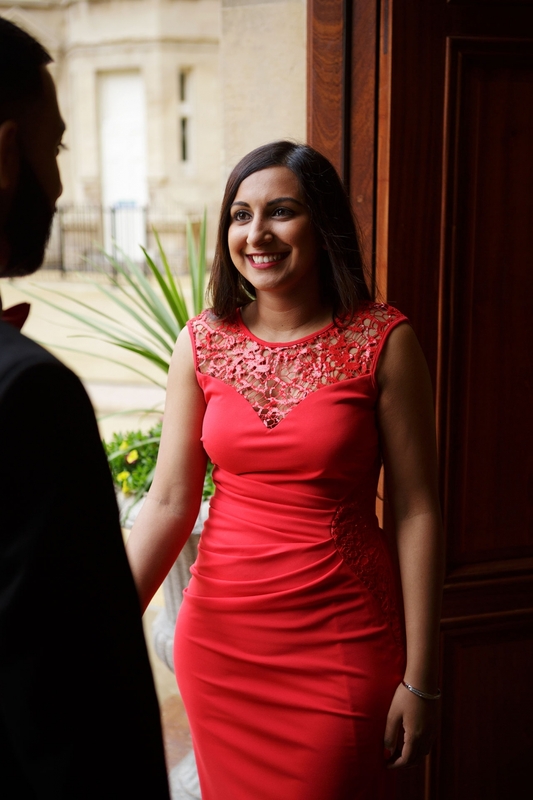 Sanita had bought a stunning new red ball gown especially for the occasion and she made Harvi dress to impress too. With the late summer weather being a little unpredictable, we were looking for a location that could offer some protection from the elements if needed, while also adding a sense of classical grandeur to the photos. 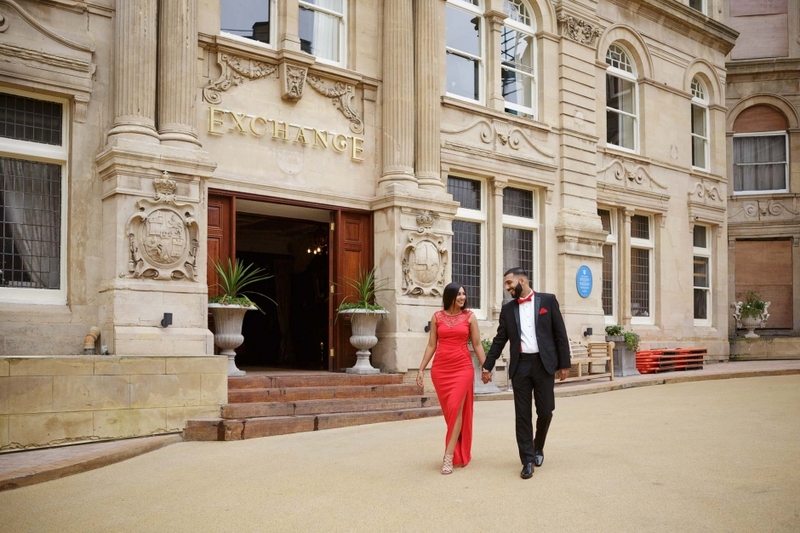 When I suggested The Exchange Hotel Cardiff for their engagement shoot to Sanita, she thought it looked amazing. Luckily they were happy to accommodate us for the engagement shoot photos and even gave us access to the gallery, which is still in the process of restoration. The reception staff were very helpful and friendly throughout the afternoon and the bar staff looked after us very well too. We did a mix of indoors and outdoors photos, hoping to show off the impressive facade of the Exchange Hotel when the weather allowed, while also making the best use of the characterful interior. We were spoilt for choice for photogenic backdrops for the engagement shoot photos. I hope to come back here soon to take more photos, and possibly try some of the amazing food on offer. Sanita and Harvi looked amazing too. Had a had lot of fun creating the photos together, helped by Sanita’s sister and her cousin too, and everyone enjoyed the shoot. They quickly got into the swing of it, relaxed and were soon suggesting ideas for poses and locations too! 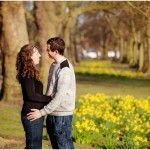 Below is a sample of some of the photos from their Exchange Hotel Cardiff engagement shoot. 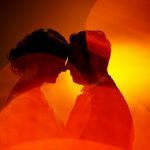 Engagement shoots are a great way to help get rid of any pre-wedding nerves about having your picture taken, so that you’re free to relax and feel confident on your wedding day. I think it really shows in the final pictures too! The rapport you build up with your photographer helps to make them less of a stranger on your wedding day too. I’d highly recommend talking to your photographer about options for an engagement shoot. If you’re planning your wedding day too, get in touch to check my availability for your day and maybe arrange to see more of my work in person.